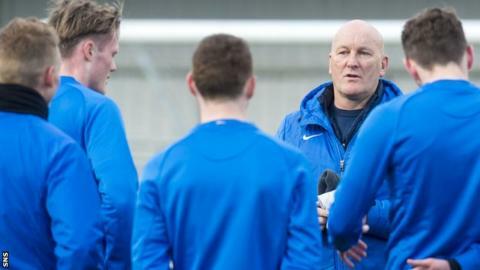 Greenock Morton manager Jim Duffy is reluctant to buy into the notion that his team face a Celtic side in crisis in their Scottish Cup quarter-final. Duffy's Championship outfit on Sunday go to Celtic Park, where an away victory would heap further pressure on home manager Ronny Deila. But Duffy says he has little sympathy for the Norwegian's predicament. "I would like to have those problems, sitting top of the league, a team full of international players," he said. "I think every manager in the country would be quite happy with that. "They're still four points clear as far as I'm aware, so I think any kind of dip at all is always exaggerated if you're at a club like Celtic. "You know the responsibilities, to win every game with style." Following two successive draws in the league, questions have been raised by former players as to Deila's suitability for the role, but Duffy believes his Celtic counterpart will not expect sympathy from fellow managers. "Sympathy's not a word I use very often," he told BBC Scotland. "I don't think you're sympathetic, I think you understand it. "But you also realise, if you choose this occupation, an occupational hazard is criticism. "When you're the manager of Celtic, the standards are there from the greats. You've got to try to emulate that." Morton's recent away record gives cause for optimism, having lost only once in 10 games. That includes a victory at Easter Road - the only home defeat Hibernian have suffered in the league - and a draw against Rangers, making Morton the only side to have taken points at Ibrox this season. While Duffy, who began his playing career at Celtic Park, knows Sunday's challenge is even greater, those results give him heart. "At Easter Road a couple of weeks ago, we got one or two breaks in the early part of the match, which allowed us to settle into the game," he explained. "What those type of results at Easter Road and Ibrox should tell the players is that it's possible and, as long as it's possible, you've got to believe it. "It wouldn't matter what kind of form Celtic are in, you still have the same principle, which is to go there and try to stay in the game. "You've got to make sure you keep it tight, you're organised, disciplined and hope that, on the day, you maybe get one or two breaks." What would Uefa changes mean for Scots? Read more on Champions League: What would shake-up mean for Scottish clubs?